C P Treasures She can be wonderful witch in this beautiful witch costume! 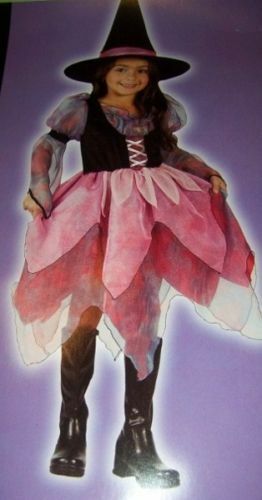 Costume featurs a tiered skirt, which is a shiny gauzy material Pinks, blues purples Top is black velvet like with rainbow colored sleeves Hat is black with pink trim Includes: Dress Hat Girls size medium 8-10 New in Package Check my C P Treasures Store for more great Halloween Costumes decorations! No returns on clothing or costumes Powered by Turbo Lister The free listing tool. List your items fast and easy and manage your active items.